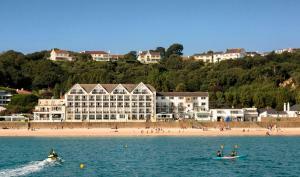 Situated in the centre of St Brelade’s Bay, Beau Rivage offers self-catering suites with en-suite facilities and free WiFi. 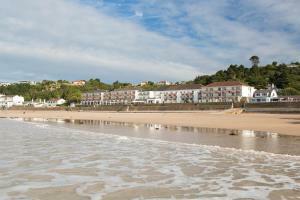 Guests have direct access to the beachfront, which offers windsurf hire, beach cafés and restaurants. Each suite features a fully equipped kitchenette with oven, fridge/freezer and dishwasher. All bedrooms come with a TV, hairdryer and radio/alarm clock. Bathrooms contain bath with shower and a heated towel rail. Some rooms offer a balcony with a sea view. Guests can dine in the on-site restaurant which offers dishes created with fresh local produce. Meals can also be enjoyed in the conservatory or terrace, and all meals are cooked to order. A range of beers and wines are also available. The property is family friendly and provides a play room for children. The historic Fisherman’s Chapel is adjacent to the beach, along with Winston Churchill park. The centre of Jersey can be reached in a 15-minute drive. When would you like to stay at Beau Rivage ? A fully equipped kitchen, an en-suite bathroom and free WiFi are featured in this apartment. With sea views, this apartment also features a fully equipped kitchen, an en-suite bathroom and free WiFi. With a balcony, this apartment also features a fully equipped kitchen, an en-suite bathroom and free WiFi. Please inform Beau Rivage in advance of your expected arrival time. You can use the Special Requests box when booking, or contact the property directly with the contact details provided in your confirmation. A security deposit of GBP 300 is required upon arrival for incidentals. This deposit is fully refundable upon check-out and subject to a damage inspection of the accommodation. Each day we'll check prices and send you an email for your selected dates at Beau Rivage. If you don't have specific dates but would like to check prices for say next weekend or say next month we can check the price too. Click to write a review and share your experience of Beau Rivage with other travellers.